Home // Medical Staff // Physicians // Kent S. Marangi, M.D. Dr. Marangi received his bachelor’s degree from Stanford University and completed a year of research at the Stanford VA Hospital. He earned his Doctor of Medicine degree from the University of California San Francisco (UCSF) in 1989. He completed residency training in general orthopedics and orthopedic trauma at Harbor/UCLA Medical Center. In addition, he completed a one-year fellowship in Sports Medicine under the tutelage of Dale Daniel, M.D., an internationally renowned surgeon and a pioneer of arthroscopic knee reconstruction. Dr. Marangi received specialty training in the arthroscopic management of complex injuries to the knee and shoulder, was a faculty member of UCSD School of Medicine, and acted as the team physician for UC San Diego. His research on knee injuries has been published and presented internationally. 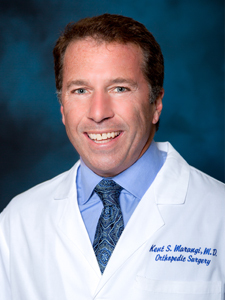 Dr. Marangi is team physician for Saddleback College and Capistrano Valley High School.